← Happy Memorial Day—What is Patriotism to You? In 1879, one of America’s leading American composers—Dudley Buck (a name often neglected today)—wrote a Festival Overture to celebrate Independence Day. The seven-minute piece for full orchestra (with optional chorus) was based on the melody of “The Star-Spangled Banner” or what the composer called the “American National Air.” Both the national music festival and Key’s patriotic song had long offered winning strategies for Buck, one of America’s pioneering classical composers whose career predates the cultural institutions, universities, and professional orchestras that would more effectively support future generations of American composers. Just over a decade before the premiere of his Festival Overture, Buck had composed his popular solo organ work Concert Variations on “The Star-Spangled Banner” (1866, pub. 1868 and recorded by James Kibbie for our Poets & Patriots project). Buck was then commissioned by famed bandleader Patrick Gilmore to compose a festival cantata for the 1872 World Peach Jubilee and International Music Festival. The composer’s resulting Festival Hymn “Peace and Music” propelled him to public recognition outside the organ and sacred music circles in which he was already recognized. This led to an invitation from the U.S. Centennial Commission to create another festival cantata, this time for the nation’s 100th birthday party—a huge exposition and arts festival to be held in Philadelphia in 1876. 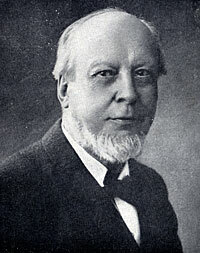 The Centennial Meditation for Columbia on a poem by Sidney Lanier led to further praise and certainly demonstrated to Buck the career value of patriotic festivals to the aspiring American composer at a time before radio, before recording, and when only one of today’s professional ensembles (the New York Philharmonic) had been founded. 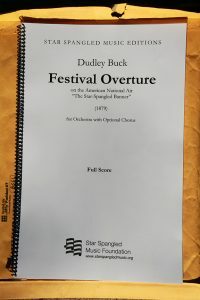 It is thus with excitement that the Star Spangled Music Foundation announces the publication of both the full score and instrumental parts to Dudley Buck’s Festival Overture on the American National Air “The Star-Spangled Banner” as the first in an ongoing series of Star Spangled Music Editions. The score is available for immediate download (click here) at no charge for educators, conductors, and non-profit organizations. Performance parts with the instrumentation Picc/2Fl/2Ob/2Cl/2Bsn/4Hrn/3Tpt/3Tbn/Tuba/Strings/Timp+2 are available by emailing info@starspangledmusic.org. In return we ask for acknowledgment of StarSpangledMusic.Org in your programs and publicity and invite you to donate to the Foundation to support future publications. Suggested donations are $10 for schools, $25 for colleges, universities, and community ensembles, and $100 for professional orchestras (click here to donate). Please also email editions@starspangledmusic.org with notice of your performances and let us know if you have any suggestions about how to improve the score and parts. 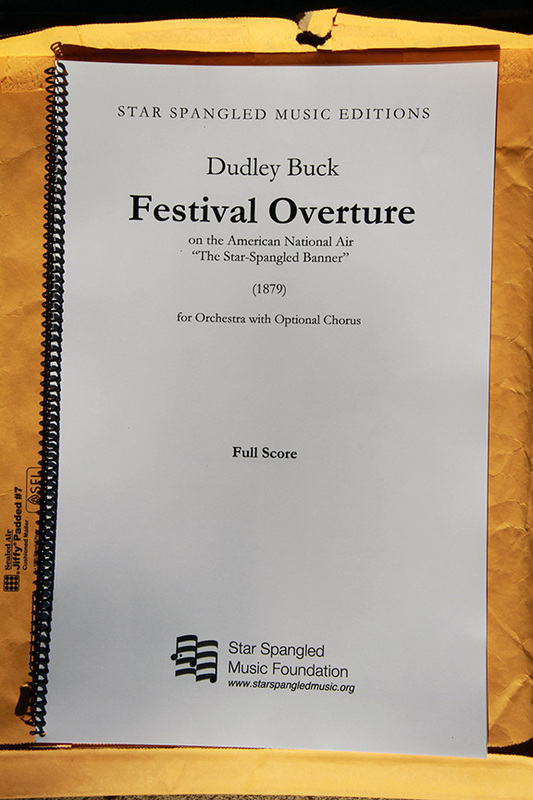 Thanks for the edition of Buck’s Festival Overture are due to Christopher Plumford, an award-winning undergraduate student in the University of Michigan’s Research Opportunity Program, who did the initial transcription of the score, and DMA composer and U.Michigan graduate Michael-Thomas Foumai, who did the final preparation of score and parts. Conductor and SSMF board member Laura Jackson and musicology Ph.D. student Mishona Collier assisted in proof reading. University of Michigan musicologist Mark Clague is the editor of Star Spangled Music Editions. Thanks go also to musicologist Lee Orr, who wrote the book Dudley Buck (2008), for his advice and support. This entry was posted in Choral, Free Sheet Music, Mark Clague, Orchestra, Poets & Patriots, The Anthem. Bookmark the permalink. Today being the Fourth of July, 2016, I just heard a performance on a radio station and was quite impressed with the quality of the work. Far superior to that embarrassing piece of rubbish that Richard Wagner wrote for the 1876 Centennial in Philadelphia, the American Centennial March. Wagner should have burned his score in the final scene of Götterdämmerung. Too bad Maestro Buck isn’t better known today.